We’re on Honshu, in the capital city of Aomori, which faces Hokkaido across the Tsugaru Strait. 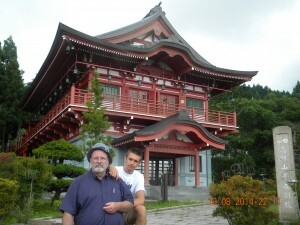 We took a long trip by bus observing all streets, villages, farms, the Japanese countryside and came to the outskirts of Aomori to see the Big Buddha. 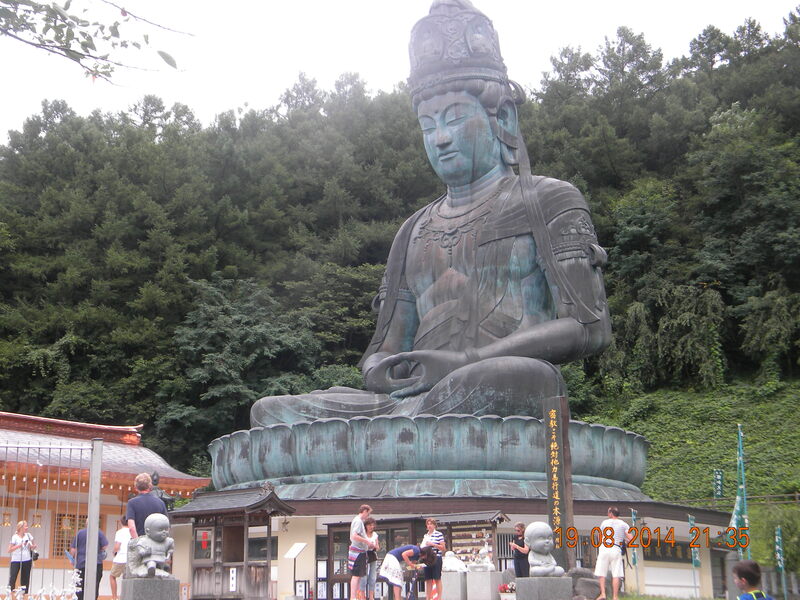 “Aomori Showa Daibutsu, also known as the Big Buddha in Aomori, is the tallest seated Buddha in Japan. 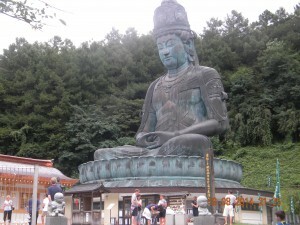 Located at Seiryuu-ji Temple (Blue-Green Dragon Temple) in Aomori City, the statue was built as a symbol of gratitude to WWII soldiers as well as a symbol for Buddha’s teachings. The Seiryuu-ji temple itself is relatively new and was founded in 1982 by a priest named Ryuko Oda. The temple grounds have traditional style Japanese architecture. In 1984 the Big Buddha statue was built, weighing in at 220 tons and is 21.35 metres (70.0 ft) tall. Underneath the Buddha there is a circular hallway with many paintings, pictures and small statues. A Buddha shrine with an offering table can also be found inside”. We looked around. Compared to the Big Buddha we looked like tiny midgets as felt maybe Gulliver among Lilliputs in the book by Johnathan Swift. My view was different. 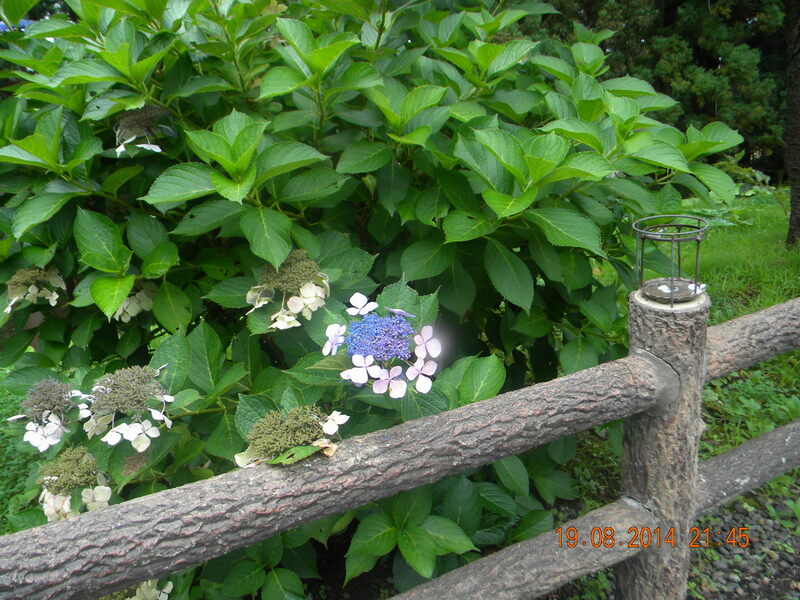 The place where the Big Buddha was sitting struck me with its serenity and beauty of the forest and vegetation. Flowers in abundance were blossoming everywhere: blue chrysanthemums, rhododendrons and those of which I did not know the names. By my previous experiences I was aware for sure that spots for building churches were picked up as usual on the top of the hill where the vantage point allows you to observe the picturesque panoramic view of the landscape. Here is the same: the Buddha is on the hill but surrounded by beautiful pine trees mixed up with Japanese blue-green jasper trees with the roots sticking out. There was some magic about that forest. The forest wasn’t the point from where one can see a spectacular view around; this forest as if prompted you to look inside you within yourself and meditate. We are going down the wide track slowly, everybody is silent concentrating on thoughts and feelings what the Buddha arose in us. Down, the temple and some buildings, offices are attached to. All of a sudden as thought from nowhere I noticed a woman in overalls sitting in the green bushes and doing something. First I could not really realize what she was doing. 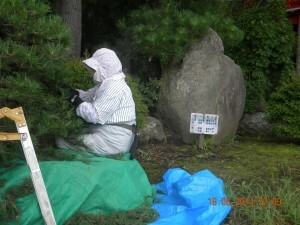 The closer I came to her asking the permission to take a picture of her, the quicker I grasped : she was cleaning the pine needles, one by one, thoroughly and meticulously, as only Japanese women can do it. Such a great job, and it was being performed in the middle of the forest surrounding the Big Buddha. In concluding words of our impressions about Japan, we could say that Japan is an interesting and fascinating country to visit, which remembers its past and looks forward to the future.